100% FREE SHIPPING ON ALL ORDERS OVER $25.00! Free Sample Only Pay Shipping! Our promotion has ended, however, join the Fragrances For Life Club and we will email you a special code for 10% off your next purchase with us! Time Is Running Out... Try Before You Buy This Holiday Season & Get Qualified For Exclusive Black Friday Deals! By Purchasing the Lala Sample During Our Pre-Black Friday Offer, You'll Automatically Be Qualified For Additional Savings During Our Full-Out Black Friday Sale!! We think women should be able to try Lala before they buy this Holiday Season. That's why we're giving our Lala Samples away before our Black Friday Event. Give Lala a try, and Only Pay Shipping! 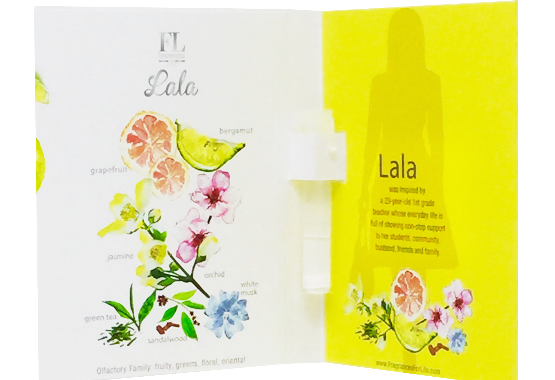 Lala's essential oils consist of bergamot, grapefruit, jasmine, orchid, green tea, white must & sandalwood. 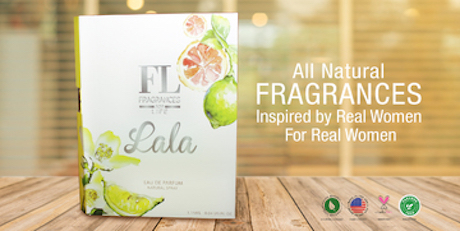 Lala was designed to be a long lasting, light, and refreshing signature fragrance. Fragrances Of The World classified Lala as being in the Citrus-Floral fragrance family with light-crisp notes. Made from ORGANIC Essential Oils, Lala's perfect balance of Fruity & Floral ingredients carefully selected by our perfumers ensures an amazingly long lasting signature scent without animal testing, exposing your skin to harmful chemicals, metals, preservatives, or dyes. Our special formula locks in the scent and leaves your skin smelling & feeling FRESH & FRAGRANT. I am in love with Lala. It's my go-to fragrance. I've found it perfect for all occasions in my life. A little goes a long way- I always where it on my neck and wrists just before I walk out the door. I wear it everyday. I highly recommend Lala, the scent is fantastic and it ships quickly! "I can't say enough good things about Lala. Even my husband noticed me changing my fragrance. The first bottle lasted 3 months with twice a day use. I absolutely love the fact I can use it as an everyday perfume and a date night perfume. No more multiple bottles. Fragrances For Life's service seems to be outstanding with follow up emails, I have the feeling I will be taken care of if anything were to go wrong." "I am in love with Lala. It's my go-to fragrance. I've found it perfect for all occasions in my life. A little goes a long way- I always wear it on my neck and wrists just before I walk out the door. 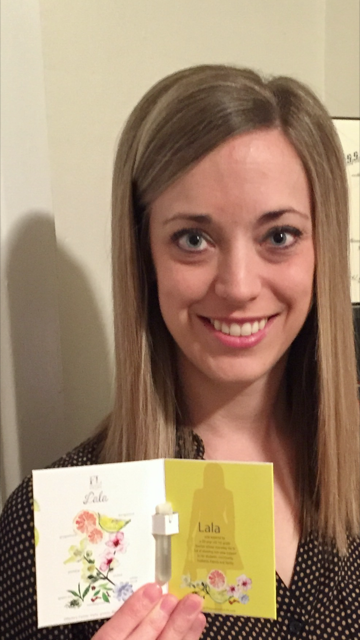 I highly recommend Lala, the scent is fantastic and it ships quickly!" Laura - *Results may vary from person to person. Sarah - *Results may vary from person to person. "I can't say enough good things about Lala. Even my husband noticed me changing my fragrance. The first bottle lasted 7 months with twice a day use. I absolutely love the fact I can use it as an everyday perfume and a date night perfume. No more multiple bottles. Fragrances For Life's service seems to be outstanding with follow up emails, I have the feeling I will be taken care of if anything were to go wrong." Elizabeth - *Results may vary from person to person. "So... they say "Fantastically Fragrant" and WOW do they mean it! This is hands down the best fragrance I've ever worn. I got my sample for free, and ordered my 3.4oz bottle after my first day of wearing Lala. So many complements, and I personally love it. The packaging is beautiful and really represents the fragrance. The shipping was fast and the package wasn't bent or dinging up at all. I'm never going back to department store perfume. I think I'm FL For Life! Inspired By Real Women, For Real Women! Join the Frangrances For Life CLUB for new videos, discount codes, and more! Copyright © Fragrances For Life. All rights reserved.